I am happy to introduce the interactive 3D Yacht App created for Palmer Johnson. Available on the Apple App Store and free to download to Ipad and Iphone devices. The SuperSport series is so unique that in our minds it definitely warranted the production of an app to show what makes these new yachts so special. The application contains exclusive content and is the perfect way to enjoy the many features the SuperSport has to offer and understand the design and build philosophy behind the series. Next generation design and fresh experiential yachting lifestyle are experienced through the rotating exteriors and the 360 interior views. The app includes handy marketing information. Ideal for brokers to present the yacht to their clients in a truly unique way, sure to produce maximum impact. There is a gallery of images for each of these stunning carbon fibre yachts as well as layouts and brief specifications. The App allows you to understand and view the fundamental principals that make this yacht series unique. I am happy to present an image that is on the inside cover of three magazines, Yachts International, Showboats and Boat International. 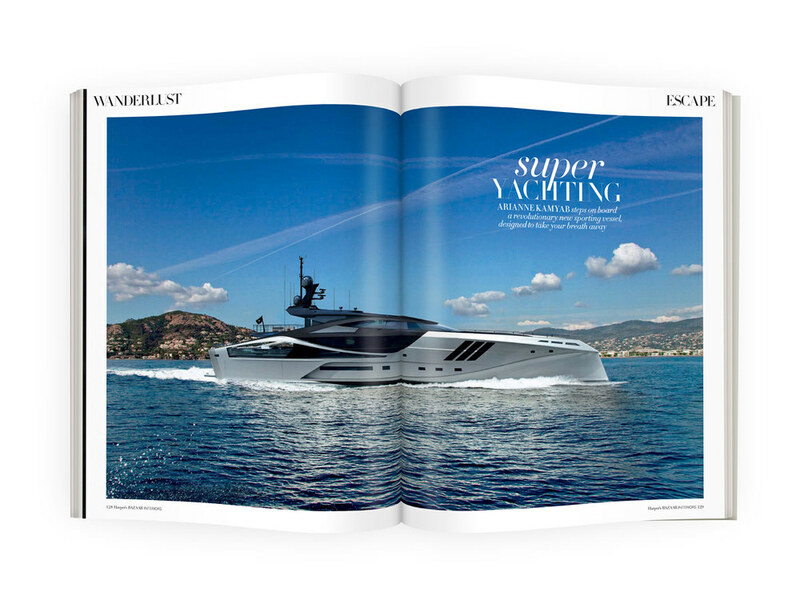 The representation of the 48 metre SuperSport Yacht was created using 3ds Max, Vray and Photoshop.